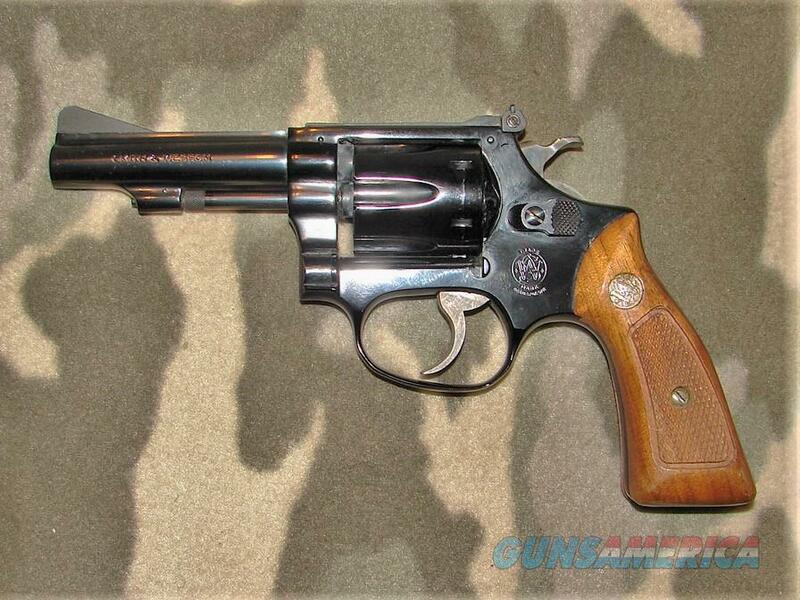 Description: Smith & Wesson Model 43 Double Action Revolver serial #M63489, 3 1/2" pinned barrel with an excellent, bright bore. The metal surfaces rate excellent and retain 98% plus of their factory original blued finish and exhibits only extremely negligible faint marks scattered about. The 6 shot fluted cylinder rates excellent and retains about 99% of its factory original blued finish and exhibits only a faint turn ring. The checkered walnut grips rate excellent and exhibit only extremely negligible faint handling marks; the grips are numbered to the revolver. The revolver features a ramp front and adjustable rear sight. This firearm has firing residue at he very rear of the barrel and chambers and as such could use a good cleaning. There is no box or papers.